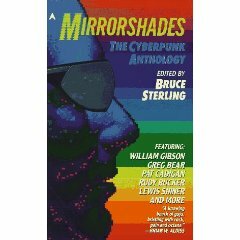 William Gibson's first professional sale, The Gernsback Continuum recounts the tale of a freelance photographer who experiences an overlapping of realities after he is assigned to work on a project entitled "The Airstream Futuropolis: The Tomorrow That Never Was". The project is to explore a futuristic rendering of America as imagined from an Art Deco perspective of the 1920s and 30s that was common to the pulp magazines of the day. The photographer's immersion into this "alternate" America leads to some bleeding through of a world that might have been and threatens his sanity. Humourous and full of odd and interesting detail, Gibson does a terrific job at capturing both the elements of the "futuristic" movement of the early part of the 20th Century and the pop culture influences of the later half of the 20th century. The photographer at one point seeks out a conspiracy theorist Merv Kihn to help explain his experience and save his sanity. The entire scene with Kihn could have been something straight out of an X-Files episode. Not a pure "time travel" or "alternate history" story, but inventive all the same and good enough in my book. If you like this you may want to check out Jack Finney's short stories for blending of past and present - notably "I Love Galesburg in the Springtime" and "The Third Level". In case you are wondering the "Gernsback" of the title alludes to Hugo Gernsback, a pulp science fiction writer and publisher during the early 20th century. As a publisher, Gernsback's pulp magazines Amazing Stories and later Wonder Stories, often featured stories and artwork of "futuristic" America depicted in this story. It was also adapted as a short TV film in the early 1990s in the United Kingdom called "Tomorrow's Calling". Dr. Andrew Wood's very informative analysis of the story for his course on Rhetoric and Public Life offered at the San Jose State University. Superb! Full text version of the short story, The Gernsback Continuum, reprinted with permission at the American Heritage Website. Review of the 1993 short film adapted from Gibson's Gernsback Continuum with cast list and links to film clips..